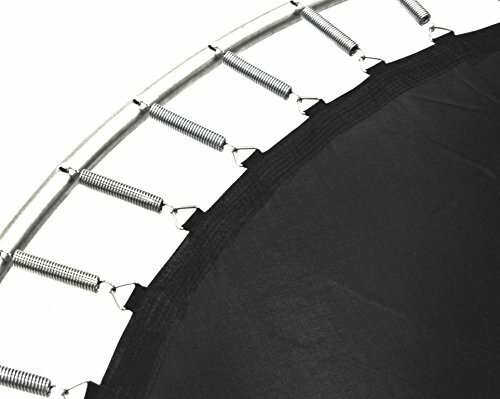 Upgrade your worn out trampoline mat with a SuperTrampoline Jumping Mat. Most of our mats are better than the original. Made with heavy duty permatron to protect against sun damage and wear and tear. MEASURE YOUR TRAMPOLINE. Measure your frame diameter, count the number of springs, and then take one of the springs off and measure it from tip to tip. Match this information to order the correct mat. Make sure you measure your trampoline, many customers forget to take all the measurements correctly. Measure several different times. Frame Size: 15 feet (Measure outside bar to outside bar). Spring Size: 6.5 or 7 inches (Remove one spring, measure from hook to hook). Spring Count: 96 (Springs are SOLD separately). If you have any questions about this product by Super Trampoline, contact us by completing and submitting the form below. If you are looking for a specif part number, please include it with your message.